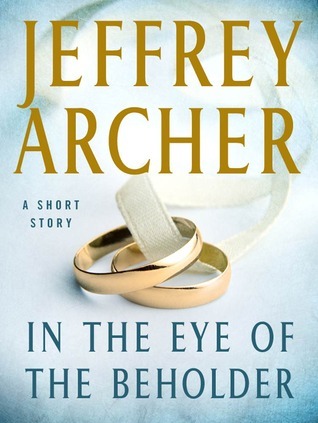 In the Eye of the Beholder by Jeffrey Archer is a short story. It is based on the author's experiences or people he came in to connect with. The title suits the story. The cover is simple, and I got mixed feelings. The two main characters are Gian Lorenzo, and Paolo Castelli had little in common. They were in the same circle but not friends. Gian is an art lover worked in his father company. Lorenzo plays as a striker for the oldest football club. Another character named, Angelina Porcelli, daughter of Massimo Porcelli, chairman of the largest pharmaceutical company in Italy. Paolo weds to Angelina. Every day the media published an article on their grand wedding. Paolo is an athlete, while Angelina is a fat woman. Everyone thinks that Paolo married to her because of her father's wealth. But for him, Angelina is her angel. Paolo's and Gian's path crosses, once again after so many years and he experiences the beautiful relationship Paolo shared with her wife. The author summarizes the story of 10 years in a few pages. This is my first read of Jeffrey Archer. This piece of his work disappoints me. The story is fast-paced but not entertaining. I feel like the core part of the story, the emotions, and the depth of character is missing. The language is simple and plain. I recommend this to newbies. I guess it is best suited to short story lovers. Taken from Jeffrey Archer's fifth collection of short stories, Cat O' Nine Tales, comes this irresistible, witty and ingenious short read.